We're well into the graduate recruitment season and in the coming months quite a few graduates are going to find themselves in the position of having multiple job offers. And despite a general Brexit-related economic gloom, all signs seem to me to be pointing to an increase in the number of graduates finding themselves in the position of multiple offers - particularly in high demand areas such as Teaching, Engineering and Software. Why do I think multiple job offers might be on the increase? • The ISE (Institute of Student Employers) graduate recruitment volumes have increased in the latest annual graduate recruitment survey, published at the end of September 2018. Respondents reported appointing 7% more graduates this year than last year. 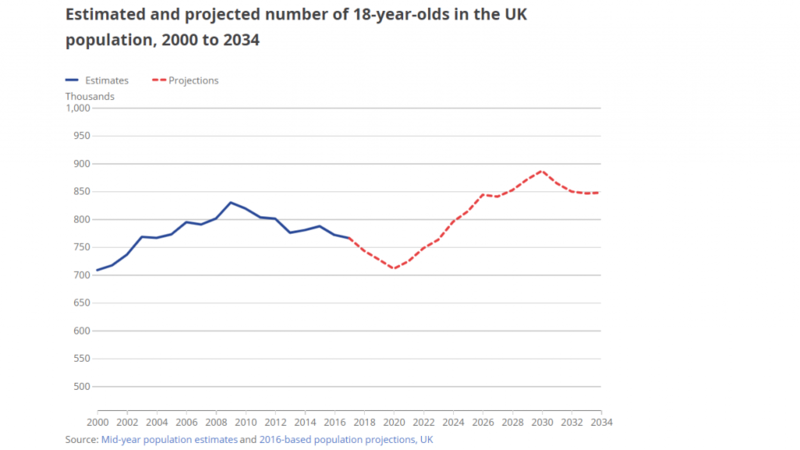 • The APS (Annual Population Survey) from the ONS (Office National Statistics) employment data has shown consistent growth and job creation in professional (often graduate) level jobs, far out-stripping the number of graduates we are producing each year. In 2017 for example we added 441,000 new professional level jobs to the UK economy, but DLHE tells us that only 291,000 graduates entered into the UK workforce. • Unemployment among recent graduates is at its lowest level in 39 years. You can find out more in the must read 'What do graduates do? 2018/19' report recently released by Prospects and AGCAS with insight from the ever brilliant Charlie Ball. Or visit Prospects Luminate for data, analysis, subject overviews and infographics on the graduate labour market, which appears very healthy indeed. • The office for national statistics tells us that the number of 18 year olds in the U.K. continues to drop until 2021, which means we will have fewer 21 year olds leaving university until 2024. So even if the number of graduate jobs stays the same there will be fewer candidates available to make offers to. • This demand and supply equation is being further intensified by two final factors. The first is a strategic factor - the increasing attention and focus from the C-suite, which is driving greater demand and more competition in the race for the next generation of leaders. The Global Leadership Forecast (from EY and the Conference Board) earlier this year named 'Developing Next Gen Leaders' as the number one challenge for CEO's in 2018. "More than 1,000 C-level executives worldwide identified the issues they expect to command their attention in the coming year. Of the 28 challenges from which they could choose, their biggest concerns weren't headline-worthy global issues like political instability, climate change, terrorism, or a global recession. Rather, the top challenges vying for leaders' action focused on their own leaders. Developing 'Next Gen' leaders and failure to attract/retain top talent were rated in the top five by 64% and 60% of respondents, respectively." • The second is much more tactical, but no less impactful, on the multiple offers scenario. It's linked to recruiters making offers to students earlier and earlier. From open days to welcome week, Christmas or Easter insights, first year internships, placements and more - employers are increasingly trying to identify and make offers to the 'top talent' as early in their university experience as possible. This makes sense for the employer, but for most students they will be advised to accept such an offer (for security, see this brilliant recent blog from my fabulous colleague Annie Gainsborough on this topic) regardless of their career plans or intentions upon graduating. Ultimately this is leading to more and more graduates having multiple offers and not quite knowing what to do with them. I think this early offering practice is also a major contributor to the increasing renege rate that many employers are experiencing. On average 7% of ISE offers last year were accepted and then the candidate reneged on the contract at a later date. In some highly competitive sectors however it is really acute with as many as 1 in 5 accepted offers being reneged at a later date. Employers - Train your recruiters on how to prepare for and manage this scenario. This is often something most graduate recruiters have to work out how to deal with on their own, but some simple tips and techniques go a long way to reducing your reneges and improving your candidate experience and reputation on campus. Let candidates know in your communications that you understand they may well be in recruitment processes for other jobs and you'd welcome the opportunity to discuss this openly with them. Setting up relationships between named recruiters/line managers and candidates are also hugely helpful, allowing the candidate to build trust and a relationship over time rather than anonymous jobs@emailaddress.com or faceless application tracking systems. Avoid pressure tactics and exploding offers at all costs. Offer day in the life experiences or conversations with current graduates to help the candidates think through their options and make an informed decision. University careers teams - I know careers professionals are well aware of this issue and the impact reneges can have on their institutional reputation and employer partnerships more broadly, so it's hardly new news. However, I wonder if given that this scenario may be on the rise, dedicated support on 'how to deal with multiple job offers professionally' may be very well timed over Christmas and into the New Year. Short training sessions, masterclasses, blogs, videos, social tips/events or other support materials featuring quotes, testimonials, advice and contributions from employers and alumni who have dealt with this topic may be particularly helpful. Timing wise this topic also neatly sits alongside how to deal with job rejections, the flip side of the coin that can be just as difficult for students to deal with (see research on fragile perfects). Students/Graduates - You may well get advice from friends and family that tells you to simply accept the first offer you get and then keep applying for the job you really want, or even to accept multiple offers. This is terrible advice, unethical and a bad start to your professional career (where people are often well connected and talk). But of course being honest with employers comes with the risk that you may miss out. If I can offer you anything it is this - experienced, good recruiters know and understand you may well find yourself with multiple offers, especially if you are a good candidate. Of course they will want you to join them, but the good ones will not only be happy to have an honest conversation with you, they will help you to make the right decision. If you get a poor reaction from an employer that pressures you to accept a role that probably tells you all you need to know about what it will be like to work in that organisation. Keep people informed on a timely basis, be honest, ask questions, do your research, seek advice and support from your university careers team and then make your decision. As soon as you've made your decision do withdraw from any other processes too - as that is a spot at an assessment centre, or on a grad scheme that someone else would be very grateful for! This is an important decision that no-one else can, or should, make for you, so make sure you can look back in years to come and feel you dealt with a difficult, but perfectly normal and to be expected, situation well and professionally. Also take a look at Annie's blog (referenced earlier in this article) for a candidates perspective on this topic. Multiple job offers are not ideal for anyone involved - graduates, careers teams or employers. However they are a very natural consequence of good candidates making multiple applications in an increasingly competitive environment. Applying a little marginal gains theory into the mix, I feel sure that if we all do a little bit to address this topic in the coming months it will add up to a big difference across the board.